In the nineteenth century, many people believed that the Arctic Sea was open water, ringed by ice. The country whose merchant vessels could find their way through that ice, and across the North Pole, would have a fantastic shipping route. But then one expedition dashed those hopes. 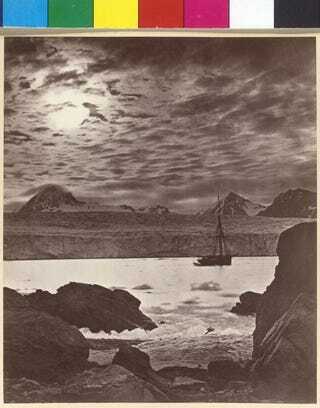 It was the Austro-Hungarian North Pole Expedition of 1872-1874 that finally proved the North Pole was nothing but ice. But they did find some islands — and they only lost one crew member to scurvy! A bespoke ship was constructed in Bremerhaven, the three-masted schooner Tegetthoff of 200 tons and 120 feet, with a 100 horsepower coal-fired steam engine. Karl Weyprecht served as master of the vessel and overall expedition leader. Julius von Payer served as leader of the planned overland (or over-ice) effort. The schooner with its crew of 24 departed Tromsø, Norway on 3 July 1872, carrying eight sled dogs and supplies for three years. On 20 August, the schooner was beset in the ice off Novaya Zemlya. The ice carried the schooner and its crew northwest. In August 1873, they sighted the mountains of an unknown land. After some initial exploration, they named the newly found islands Franz-Josef Land in honor of their Emperor. The ice continued carrying them slowly north. One crewmember died of scurvy, but the others remained in relatively good health. Reaching 82°5N, they decided on 20 May 1874 that there was no open water to the north and that the time had come to abandon the vessel and make their way back. After three months of sledging, they reached open water. Read more at Maritime Professional.